HMSV Simoom was an iron hulled (350 horse power steam engine) screw Frigate. She was named after a hot, dry desert sandstorm and launched on the 24th of May 1849. Simoom was converted to a troopship in 1852 as stated in The Weekly Dispatch, 26 January 1851; 'the new steam frigate HMS Simoom, if she be found, on trial, to be fit for similar service, is to be also fitted as a troop steamer, to carry 1,000 men'. 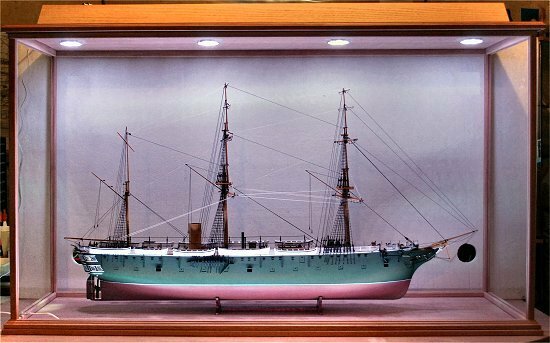 Simoom served as a troop ship at the Crimea from 1854 to 1855, at Pei Ho fort in 1859 and at Ashantee from 1873 to 1874. She was sold to Norwegian interests in 1887. 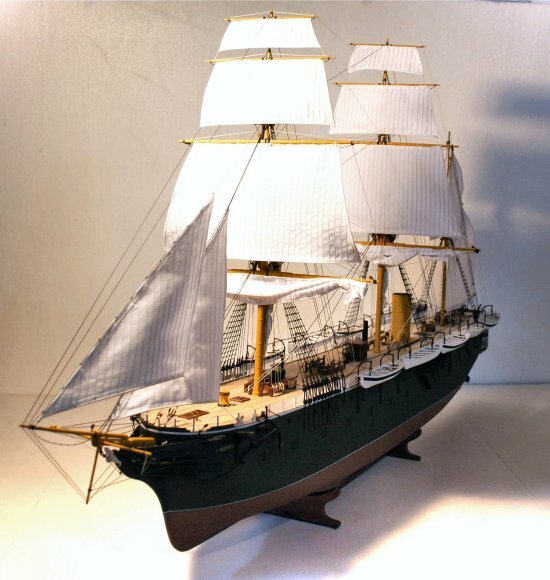 The Admiral Class model shown here was built for a client whose forefathers travelled and immigrated to Canada as 'extra' passengers on the British troopship HMS Simoom. The image above shows a custom oak and glass display case with remote controlled LED lighting in the process of being 'fine-tuned'.